Today's recipe is one of those things that's going to end up as something else tomorrow. I was looking for a recipe for home made chicken nuggets for Miss A. Not that she's ever eaten a chicken nugget in her life. Nor that she's ever asked for one. But reading some other blogs recently about 'fake aways', I thought that I should try some other things out on the family. We have home made fishfingers (sometimes) and pizza will never come from Dominos again. Partly because I'm stunned at the expense, but mostly because as someone who hates pizza, I fell in love with Dan Lepard's pizza bases this year and so any future rare pizza treat will most definitely be home made. The chicken nugget recipe I settled on is from Good Food and sees the chicken pieces dipped into red pesto before breadcrumbing. Red pesto is something that's only happened into my fridge once or twice in my life so duly researched a recipe to make my own. Delicious Magazine had a recipe that I had all the ingredients for - parmesan, pine nuts, fresh parsley, semi-dried tomatoes, garlic and chilli. The recipe states that it should be chunky rather than completely smooth. I actually liked that concept because it meant visibility of all the component parts - obvious flecks of parsley, cheese and nuts with cherry red chunks of tomato. 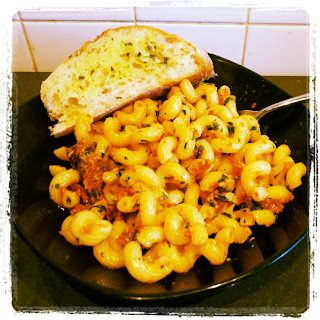 And served for a taste test with pasta tonight, it was really enjoyable and the freshness from the parsley made this a hands down winner over the cloying taste of shop-bought pestos. It's not very photogenic. The bowlful of pesto I made looks a bit yucky, but mixed with the pasta, the photo isn't great either so I apologise in advance for this. However you must try this recipe. So simple, so fresh, so making it again. It's not paste-y enough for the chicken nugget enterprise tomorrow so I'll pop it back into the blender with a shade more olive oil. You can find the recipe here.